The Jacanas are long-legged marsh birds belonging to the group of tropical waders in the family Jacanidae. They are found worldwide within the tropical zone, inhabiting freshwater ponds, the margins of lakes, swamps and lagoons where it feeds on insects, small mollusks and seeds of aquatic plants. Eight species, placed in six genera, are found in both the New and the Old World tropics. There are 2 species in the Americas; 3 species in Africa and 3 species in the Far East down to Australia with 9 subspecies in Central America and 3 subspecies in Australia. 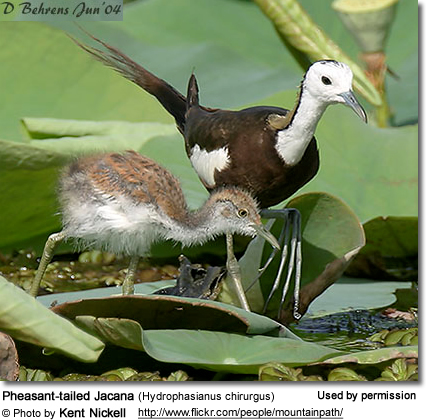 Most species are sedentary, but the Pheasant-tailed Jacana migrates from the north of its range into peninsular India and southeast Asia. 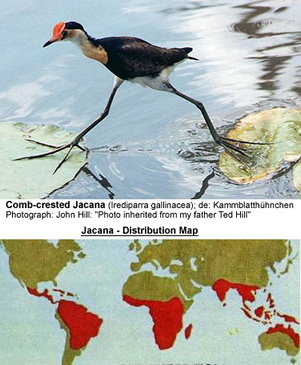 Jacanas are identifiable by their huge feet and claws which enable them to walk on floating vegetation in the shallow lakes that are their preferred habitat. They resemble the common moorhen and other rails, such as coots and gallinules. They have a sharp spur on the elbow of the wing, which is a formidable fighting weapon. Their most distinguishing features are their long toes -- indeed the longest toes of any bird - and the longest claws on the reverse toe. The claw of the lotus bird is 7cm. The combined length, from tip of reverse toe to tip of forward toe, in this bird is 20cm. 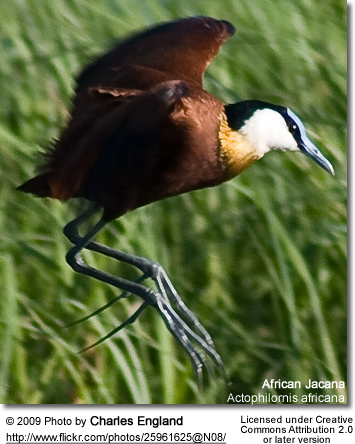 In the lesser jacana, smaller than the sparrow, the reverse claw is 4cm. These same toes make walking on land ungainly and, though occasionally seen on land, this is a rare event. 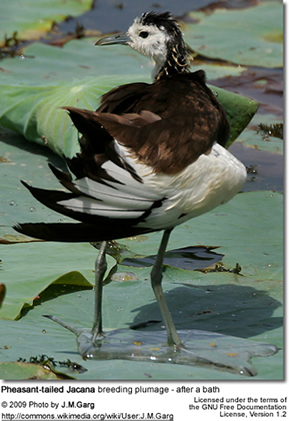 he sexes in all jacana have the same coloration. The female is larger than the male. In most species both sexes have a dark brown or black plumage, a yellow wattle at the base of the bill and greenish-yellow wing feathers that are conspicuous during flight. The females are larger than the males; the latter, as in some other wader families like the phalaropes take responsibility for incubation, and some species (notably the Northern Jacana) are polyandrous (meaning they form stable unions with more than one male) . However, adults of both sexes look identical, as with most shorebirds. The annual molt of the primaries (longest wing feathers) proceeds medially-laterad in the Central American jacana and laterally-mediad in smaller jacana species; the rest of the species lose all their wing feathers simultaneously which makes them unable to fly. Food consists of insects, small mollusks, seeds of aquatic plants picked from the floating vegetation or the water’s surface. The nest is a mass of floating vegetation and the male incubates the eggs and cares for the young. The average four eggs in each clutch. Te eggs have a glossy lacquer-like surface, its color ranging from yellow to nut-brown with, except for the pheasant-tailed, a scribbled or speckled design. Incubation period is 22-24 days. The chicks, covered in dense down with camouflage design at hatching, are able to get about on their own swimming and diving within a few hours. Lesser Jacana - Microparra capensis 41 18 25 x 18 ?